Is whitewater rafting safe to do? Let’s not beat about the bush: whitewater rafting is a participative adventure activity that does come with inherent risks, full stop. That said, if it wasn’t for those risks there’d be no adrenaline, no challenge, no fun… and you might as well sit at home and watch TV. So what’s the way forward? (1) understand these risks, (2) assess your overall tolerance for risk and (3) make an informed decision based on your own ability to mitigate those risks. There is a risk of drowning. We mitigate against this risk by providing you with a Personal Flotation Device (PFD) – which is a “life jacket” to all intents and purposes although for some reason the technocrats insist we call them PFD’s. We also give a pre-departure technique and safety briefing, plus have river guides escorting you the whole way down. There is a risk of bodily injury from muscular strain or impacts. Dislocated shoulders, bumps and bruises, the occasional gash – ouch – but nothing that couldn’t also happen on a slippery bathroom floor. There’s padding in the PFD’s and we insist you wear a helmet whilst on-river. It that fails we have a first aid box along to attempt damage repair. There is a risk of increased difficulty due to variations in weather and river levels. What we are saying here? Well, in essence our river is not a controlled “park” – it’s the great outdoors, it rains some days, or cooks with heat on others. There is wildlife and even less predictable human life. The river level drops sometimes exposing more rocks, whilst at other times it is full or even flooding with debris and strong currents. Our guides over the years have experienced almost all the variations that nature throws our way. Standard Operating Procedures (SOP’s) have been laid down based on this experience. River guides provide daily leadership on the trips based on these SOP’s and their decisions should be respected. There is a risk associated with transport to the river. Whilst the corrugated dirt roads and wet-bummed passengers quickly ensure that our transport vehicles look a bit tired and worn, our vehicles are subjected to regular mechanical servicing and are tested bi-annually for road-worthiness in order to maintain their Public Transport Permits. Our drivers are disciplined by strict internal Codes of Conduct and are licensed for public transport. Similar standards are insisted on from sub-contracted transport suppliers. There are crocodiles, snakes and the occasional stray hippo. In this regard we keep an eye out for them, they keep an eye out for us, and both parties definitely prefer to keep their distance. What skills or level of fitness is needed for whitewater rafting? No previous experience is needed, nor any special level of fitness. However, this activity is Participative with a capital P. Its not a boat cruise that you can do with a cocktail glass in hand. There also isn’t a guide who rows your raft for you whilst you smile and look pretty. This not Venice nor Yangshuo and you’re not going to be on a gondola or a bamboo raft. It is however useful to be able to speak and/or understand English. All instruction is given in English or Siswati and not being able to fully comprehend such communication could put you at risk. 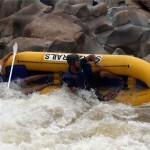 Swazi Trails now offer rafting on two entirely different river systems in Swaziland – on opposite sides of the country. We don’t raft both on the same day, its either one or the other and we have the flexibility to choose which section is going to deliver the most fun and adventure on any given day. The Great Usutu River, otherwise known as the Lusutfu River in SiSwati or misspelt as the Usuthu River on occasions. It is the largest river in Swaziland and drains approximately 50% of its surface area. The river has its source in the highveld areas of South Africa near Ermelo. It has 3 major tributaries in Swaziland, namely the Lusushwana (Little Usutu), the Ngwempisi and the Mkhondvo rivers. After it exits Swaziland to the east, it joins with the Pongola River and then becomes known as the Rio Maputo for its final journey into the sea in the Bay of Maputo, Mozambique. Our rafting section is roughly between Sidvokodvo and Siphofaneni in an area known as the Bulungapoort. This is in central Swaziland, south west of Manzini. The Komati River crosses northern Swaziland. Its most significant feature is the huge Maguga Dam which collects its waters in the deep valley between Malolotja Nature Reserve and Piggs Peak. We raft immediately downstream of Maguga Dam. This is a very mountainous remote area and consequently very scenic. Our trips here are not just about time on the river, but the whole day’s tour from start to finish. Can non-swimmers join whitewater rafting trips? If you’re a non-swimmer and have the liberty of choice, then its better to raft in the winter season – June to October, or only on the Komati River. During these months the river is generally a lot more shallow and in most places you’ll be able to stand if and when tipped in. Where do whitewater rafting trips start from? All our trips depart from our office premises at Mantenga in the Ezulwini Valley, which is roughly halfway between Mbabane and Manzini. It is the main tourism area in Swaziland and home to many hotels, lodges and other accommodation facilities. The whitewater rafting sections we use are both 45-60 minutes drive away and we provide transport there and back. Although parking at Mantenga Craft is obviously “at own risk”, this is a safe and quiet area with no history of car break-in’s or theft. Parked cars are generally visible from our office windows. It makes sense to stay somewhere close to our whitewater rafting departure point, although Swaziland being small and travelling distances being relatively short, you could stay almost anywhere. Happy Valley Resort – Recently re-built and very glitzy. Staying at the above venues provides considerable flexibility as it allows us to travel to either of the rivers that we raft on easily… at the drop of a hat. You “can” however, stay closer to the two rivers we use, and we “can” pick you up on our way past. For example Nkonyeni Golf Estate is suitable for pick-ups when we are rafting on the Usutu. In the other direction, Hawane Resort, Malolotja Nature Reserve and Maguga Lodge are all passed on the way to the Komati. The risk however with these outlying options is, that if you are staying at Maguga for example, and thinking we will be rafting on the nearby Komati River, and instead we are forced by raft on the Usutu due to a reduced water release from the dam, then there will be no pick-up and you’ll need to drive an hour through to our offices. Not impossible to do, but it’s a hassle none-the-less. Yes – it is possible. Generally its best to plan this for your second day, as although you can arrive in Swaziland in time (earliest border post opening is 07h00) it means you’ve got to get going “hellava” early. On day 2, you can raft a Half-Day trip and then head onwards to your next destination with ample time to reach KwaZulu- Natal or Mpumalanga before dark. Half-day trips are only available when we are rafting on the Usutu River. If we are busy with whitewater rafting operations on the Komati River, it would also be an option for you to follow our rafting vehicle to Malolotja or Maguga and park your car there. We would be able to drop you back at your car after the trip, which would leave you with lesser distance to travel when exiting Swaziland via Matsamo/Jeppes Reef or Ngwenya/Oshoek borders. This Komati trip is not however a half-day, so the earliest you will be on the road is 15h00, more likely 16h00. This is fine for reaching Malelane, Mbombela or Komatipoort in daylight, but do not count on there being enough time to access camps inside the Kruger Park. Hotel or lodge pick-up’s are not inclusive in the whitewater rafting price, however we do accommodate this when and where possible. Generally if your hotel or lodge as en route to the river we can drop-by to pick you up, however an extra charge is levied if we have to send a non-rafting vehicle to pick you up, or if your accommodation is in the opposite direction to where we’re going. As a broad guideline we say whitewater rafters should be between the ages of 12 to 65 years. However, when conditions are favourable we are happy to take younger or older folk. We’ve had numerous six year old kids enjoy the river and an adrenaline-seeking 74year old, as well. During the lower water winter season generally any age from 8 years is welcome, but we’re a bit stricter in summer, especially when the river is in flood. For families with younger kids we recommend booking a half-day trip, or a Full-day Combo trip, rather than the full-day downriver trip. We are less likely to waive the 12-65 year guideline on the Komati River Trip. This is because the trip is more challenging. Long nails give ladies a fair amount of grief (and pain)… so if you can, please trim your nails before rafting. Why? Well, the paddling motion involves a repetitive process of drawing your hand, which is wrapped around a paddle backwards down the side of raft. The raft has a few seams that seem to be good at snagging and ripping or breaking nails. Give up the vanity for a few weeks ladies… and get with the action! Are photos inclusive in the trip price? Well – if we’re getting litigative now, then the answer is “no” – images are a free extra service, but not an inclusive part of the package. Whilst every effort is taken to capture and provide photographs on all our trips there are occasions when all guide hands are needed for manning points of rescue, moreso on flood level trips. There are also occasions (too frequent for the boss’s liking) when the on-river camera is dropped in the water, damaged due to extreme temperature conditions or subject to simple fails due to human or system error. In these instances we kindly ask your understanding, cameras can’t be repaired in Swaziland, nor are replacement readily available. We do keep a spare camera on standby for such occasions in the office, but even that operational foresight has been undone by a serial cases of butter fingers. Well, the earlier the better is always good for us, as it helps us to plan staff availability, vehicle usage etc. but the reality is that we can generally process bookings right up until the day before the trip. We guarantee departures for a minimum of 2 persons on a daily basis, except for under special circumstances when we close for operational reasons or restrict the day’s operations to servicing one large group booking. You can even try your luck first thing in the morning of the trip, and if you catch us before we seal the catering cooler boxes (just after 08h00) you can still jump onto the whitewater rafting departure for that day. Our office is open 7 days a week 08h00 to 17h00… and if you can’t reach us during those hours we have an after hours mobile number +268 76020261 for last-minute bookings. Just don’t call us in a drunken stupor at 02h00 in the morning… ‘cos its not a 24hr call centre and you’re likely to get some choice words for your lack of consideration. Maybe send an SMS or a WhatsApp message instead. Can we book whitewater rafting online? Yebo-yes! We’d love you to book whitewater rafting with Swazi Trails online… it’s so much easier and tidier. All the admin is then out of the way in advance, you don’t have to carry cash or a credit card with you… and the trip can kick-off straight-away. Our online booking site also has all the info you need: times, directions, policies and options for payment from credit card to EFT, bank transfer and PayPal. Get with the times – book online! Most times of the year the Great Usutu River can be considered a grade III whitewater, although when it is full it is certainly grade IV, with grade V and VI whitewater sections which need to be avoided. The Komati River is almost consistently Grade III whitewater with one Grade IV before lunch and one Grade IV+ just after lunch. Both can be portaged and often are. Grading a whitewater river with just 6 numbers (easiest I to hardest VI) is always tricky due to the many variables involved in river running. The fact that we use 2-man rafts, which are self-propelled without a guide on board, means that even if the river is not as high volume as the Zambezi or the Nile, the day trip can be more challenging for individuals than let’s say floating downstream on a 10-man raft, where the only requirement is to hold-on. Anecdotal evidence and comments regularly rate the Great Usutu as comparable in difficulty to the better whitewater rivers in the world. The river is certainly more gentle during the lower water season – May to November. Yes and no – if there is space in the vehicle, we are happy to charge a nominal to cover lunch and transport, but if space is limited then this is not an option. The Great Usutu River section, our trip can be followed in a private vehicle, but please be aware that the road along the riverbank is rough, corrugated and sometimes muddy. There are no toilet facilities and shade is limited. There are also only a limited number of places where the rafters can be seen: on departure at the put-in, at the LUSIP weir site and then at the lunch spot and final full-day take-out point. One of the bigger rapids can be reached walking upstream from the lunch spot, but this involves over 300m of hopping over rocks, not something easy for someone who is not nimble and light-footed. The Komati River section is even more difficult to shadow. You can access the put-in point and the take-out point only. The take-out point is however very scenic (The Gap Waterfall) and you can walk upstream with our driver when he delivers the picnic lunch. Again – it’s not flat or easy and you need to be nimble. I am part of a group, but I don’t want to raft or go on the water, what can I do instead ? Well in fact we’ve got an answer for that: we can run a parallel trip for you, either walking or mountain-biking. This works for both the Komati and Great Usutu trips. You’ll depart with the group of rafters and we’ll drop you with a guide at a designated spot, to either cycle to our midday lunch spot or to walk. Both options include the potential for enjoying scenery and cultural interaction. PLEASE however be aware that Swaziland is not flat, the trails are not beautifully manicured and for many months of the year it’s cooking hot. In all honesty rafting IS easier, but if you’re really aquaphobic, despite being an adventurous soul, this could be a way for you to collect your own tales of heroics for swapping over the dinner table. Is your whitewater rafting considered to be responsible tourism? we set aside a small portion of every single rating payment we receive for community development. Over the years we have focused on assisting the Mphaphati community and specifically the local primary school, where we have been able to build an office block and houses for teachers. Read more about it here and here. Currently we support an NGO called Young Heroes which assists child-headed homesteads and children without external sources of income to remain in school, care for their siblings and get their academic or trade qualifications. All our catering has been subjected to a local woman in our community, a single mom, who uses this income to put her two sons through school. Managing Director, Darron Raw, who oversees the rafting operation has been guiding whitewater rafting trips since 1989 and is one of the the pioneers of river rafting in Southern Africa. He is also a founder member of APA. In colour – no! The Great Usutu River is definitely a permanent shade of brown, ranging from a subtle hint in the winter months to an almost gritty chocolate after heavy rains. In quality – also no! But we don’t drink it – so this need not be a concern. Exposure to splashes and the occasional spluttered mouthful is unlikely to result in any side effects. In contrast the Komati River water comes out of the base of Maguga Dam and it is cool, clear and clean. Our rafting team regularly drink directly from the river on hot days with no ill effects. Bilharzia is known to occur in almost every east-flowing river in Africa and it is highly likely that it occurs in certain sections of the Usutu and Komati rivers. It does not however appear to be prevalent in the section where we raft. This conclusion is drawn from the fact that our river guides, many of whom grew up bathing in these waters, have never shown positive results from bilharzia tests. This parasite is a nasty piece of work though and our advice to anyone who travels in Africa, Asia or South America is to have a test 6 months to a year after returning home, as bilharzia can remain undetected for decades before irreparable organ damage is detected. There is clinic in Siphofaneni (15-30min away) from the Usutu, private hospitals in Manzini and Ezulwini (45-60min away) and a Paramedic Service (Traumalink 911) based in Mbabane (60-80min away). The closest facility to the Komati River is Piggs Peak hospital (90-120min away) There is no helicopter evacuation service in Swaziland. Note: The cost of paramedic evacuation and/or hospital care is for the rafting participant’s own account. Yes – we have a Public Liability Insurance policy for E 5million and Passenger Liability Insurance to statutory requirements of E 1 million. Public Liability Insurance comes into play when gross negligence is proven in a court of law. This is likely to be rigorously defended and may take years to be finalized. To cover the costs of immediate and recuperative medical attention, individual personal medical insurance is strongly advised. Insurance can be purchased as an optional extra on our online booking website – buy travel insurance online here. 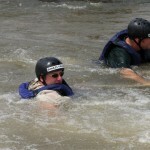 Yes – we have on a few occasions cancelled rafting trips when the Usutu River has flooded over its banks. This cancellation may happen at short notice as often the river level can only be gauged on arrival at the put-in point. Guides will take both river conditions and perceived client skills/experience into account when taking such a decision. We have also cancelled trips when the river gets too low. On some years during winter months we are affected by low water on Sundays and Mondays. This is due to the shut-down of hydro-electric power facilities upstream of us on the Usutu River, which impacts on water flow. Such impacts only effect us on 1 out of every 3 years on average. On the Komati River we are dependent on water releases from the Maguga Dam. It can happen that the dam does not release water, a scenario that normally only happens when heavy rain downstream negates the need for irrigation and results in the water release being saved instead. We communicate daily with the Water Bailiff and we try our best not be be caught out. The flexibility of being able to raft on two different rivers has also reduced the likelihood of us needing to cancel trips. It is seldom that both river’s are dry, or that both river’s are in flood, due to their constrasting flow and water management regimes. In the instance that we do cancel a trip, a full trip refund will be offered. For rafting+accommodation packages, the rafting trip component will be refunded, but not the accommodation or meals components.